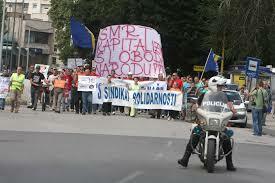 The mayor of Tuzla was elected by workers’ votes and was happy to provide the after-sales service. Three buses were sent to Orasje at ten in the morning. At 13:30 they set off back to Tuzla. 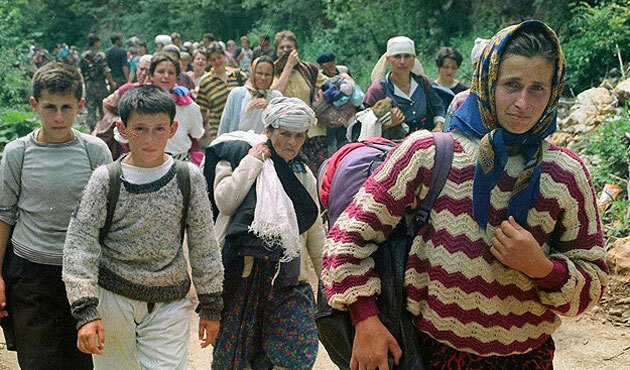 A whole hospital was requisitioned to receive the marchers who were completely exhausted, for the Bosnian state takes care of those to whom it administers, even if it doesn’t give them enough to eat. There would be warm drinks and the famous Ćevapi kebabs. They even hired six cabs to get everybody home! Yesterday they couldn’t raise a bus fare, today everybody gets a taxi home. It’s a miracle! To welcome them back, even as I write this, a lot of citizens are heading for the meeting-place at the canton government office. Everybody remembers this building which was set on fire last February. Hasan, who wanted to go on but not to let everybody get dispersed, says they are going straight there “to see if they haven’t freshened it up a bit in the five days we were away. If not, maybe we could sort it out and put it back as good as new so everybody can admire it”. Work may not start tonight, but it will one day soon. Bosnian cauldron ready to blow? Music: The Sounds of Nature?